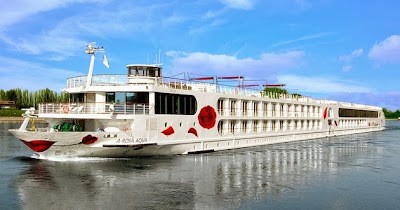 A-ROSA Cruises was established in 2000 and operates river boat cruises throughout Europe on the Rhône/Saône, Rhine/Mosel/Main and Danube rivers. A-ROSA is one of the most ‘inclusive’ river boat experiences in Europe with complimentary alcoholic and non-alcoholic beverages throughout the ship, open dining, gratuities, a selection of shore excursions, ground transfers and taxes all included in their rates (quoted in USD). A-ROSA offers travellers an informed, intimate experience of Europe’s most beautiful riverside cities, villages and landscapes. The sleek, streamlined ships have been designed not only to elegantly ply some of the world’s most historic and storied rivers, but to offer guests a true sense of luxury, comfort and a feeling of home-away-from-home. The cruises feature a host of shore excursions to explore castles, country sides, vineyards and museums as well as some of the continent’s most exciting, dynamic and diverse cities from Budapest to Provence and everything in between. Itineraries are created specifically for active travellers seeking cultural adventures and an opportunity to delve more deeply into passions like food, wine, art, music, and history. Lynne Ireland's Inspired Luxury represents the brand in Australia.